Others will surely weigh in but id recommend a Stanley Bailey #5. Shouldn’t be too expensive. For a $100 you could probably get a nice 4 5 and 6 as long as you don’t mind restoring them. Get a vintage Stanley #4 or #5. Look for one with a patent date behind the frog. Some good info on Time Tested Tools. I would rather get something new. Any suggestion, I don’t think I am able to restore these due to my lack of experience at this time. It is not hard to restore and sub $100 new planes may cause you more frustration than than you think. Sharpening can be done on a flat surface such as a table saw or float glass. Actually let me find you a video. I would also argue for a smoothing plane before Jack. I would rather get something new. Any suggestion, I don t think I am able to restore these due to my lack of experience at this time. If you want new, Woodriver is about as low of a price as I’d go. 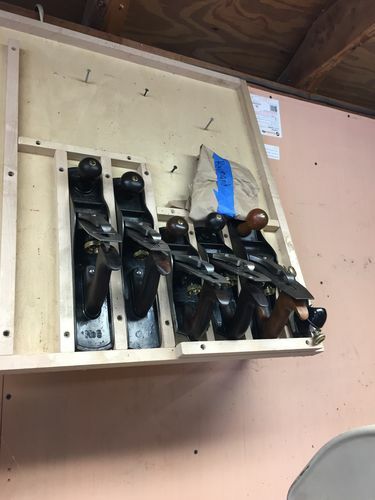 Avoid new Stanley planes. Better quality would be Lie-Nielsen. If you don’t want to spend the money above, then you’re going to have to look vintage. Record makes a jack plane for about $100. Grizzly makes one for about $40. I assume the Grizzly is rough around the edges. I had a couple of old planes, Stanley #3 and Miller Falls #4) than I had tried to “restore” with terrible results. So, I bought a new Woodriver #5-1/2, a combo Norten water stone and el-cheapo sharpening jig/guide. With it, I was able to gain better knowledge of how a sharp, good setup plane felt and worked. The Woodcraft store manager spent some time with me doing initial setup on it. I also picked up a low angle block plane that he helped me with. I’ve since gotten the Miller Falls tuned to decent shape. Someone here gave had tips on getting the chip breaker tuned which helped a lot. The depth adjustment knob has a lot of backlash and, when engaged, is very sensitive. So, it works better but I’m not yet happy with it. The #3 has broken lateral adjustment and other issues, so I’ve not really worked on it anymore. And, I wanted a jointer so I bought one from DonW at Time Tested Tools (see link in reply above). I as able to reassemble it, get it tweaked/tuned and it has been working great. DonW does a great job restoring/reselling old planes. But, I think the experience I gained from having the Woodriver has allowed me to make best of my use with the #7 from him. Stanley # 4 and or #5 and a good block plane, 60 1/2. The planes will only be as good as the blades in them so learn how to sharpen them. Check out Bertha’s blog on sharpening. The problem with restoring a plane is that you cannot do it if you don’t know how a properly tuned plane should feel. I would recommend getting an already tuned vintage #4 or #5 (the #5 is more versatile, but the #4 is better suited to cutting boards). There are probably some people on this forum who would sell you a working-condition plane for a reasonable price. I know that Don @ http://www.timetestedtools.net/ is a member of LJ and sells restored/repaired planes on his site. Some of them are tuned and ready to work right away (and he indicates which ones are already in good working condition). David, let me be the voice of experience! Don’t buy and restore an older Stanley!!! It will lead you down the road to a serious addiction! It will cause you to spend serious hours and dollars buying them and learning everything there is out there in the world about them. I’m certain you have many better things to do with your life. Heed my words of warning!!! I have a Stanley 4 & 5 to be restored that will be looking for a home soon. God knows what I got myself into. Who knows I might learn something from this experience. $50 it was worth a try. I can do this, maybe!!! I know I might be asking too much but I was wondering if could assist me to find another vintage planer. I keep getting outbid on ebay for the planer. There are plenty on ebay put I don’t know which one is good. David, definitely not asking too much, people here like to help good vintage tools get saved and put to use. You can post the auctions you’re considering, but you might increase your competition that way. But better yet, it’s likely that there are some LJs that sell tools that have a jointer for you. You’d reduce your risk a lot compared to eBay by buying from them. You could post in the trade and swap forum saying what you’re looking for and you’re likely to get responses and a fair deal. Also, update us on the one you got. Do you have it working well yet? If not, post pictures and ask away, we’ll have it taking sweet curly shavings in no time. Others will surely weigh in but id recommend a Stanley Bailey #5. Shouldn t be too expensive. For a $100 you could probably get a nice 4 5 and 6 as long as you don t mind restoring them. So… I read it all the time – you can get a bunch of planes for a buck. In reality the planes you mentioned go on ebay for not so much less than new. Is there a secret plane place everyone knows about besides me ? Forget about ebay and just buy from Don (LJ on here that sells tools). As I said earlier, Don’s site is probably your best bet for finding a good first plane. Also, the Fridge sounded like he would sell you a tuned #4 or #5. You will have one heck of a time tuning a first plane by yourself, so buy one that is already in good working condition as your first plane. After you know what a tuned plane feels like, you can buy subsequent planes on ebay and restore them. Carloz, I have found that ebay auctions that end on federal holidays (such as Labor Day Weekend) have much lower winning bids. I got my type 11 Stanley #4 on Ebay 2 years ago during Labor Day weekend for $32, and I saw others go even cheaper that weekend. You can get a #4 or #5 on eBay and not have to restore anything just sharpen it. No. 4 up with 9hrs left at $35 and no bids and it is in collector’s condition. No. 6’s are up for $9 to $45 BIN in the $50 – $70 range. a given day, just like a regular auction house auction. selling for the premium Stanley’s were getting. sell for about 10x what I paid for the Craftsman. size numbers may yield some overlooked listings. This is what I started out with in the way of hand planes. The old wooden jointer was passed down to me in the family. A #4 smoothing plane—even though I collect and restore Sargent planes, this WoodRiver #4 is great to pick up skills with. Important to note, this plane has much thicker blade and cap iron. That results in less/reduced chatter and better planing, particularly when adjusting the plane for super thin cuts/passes. A #6 fore plane. This Sargent #418 was also a family pass down and my FIRST Sargent plane. Great for flattening reasonably small projects boards. I ended up putting a thicker HOCK blade on it and eliminated the chatter and just love its enhanced abilities.
. 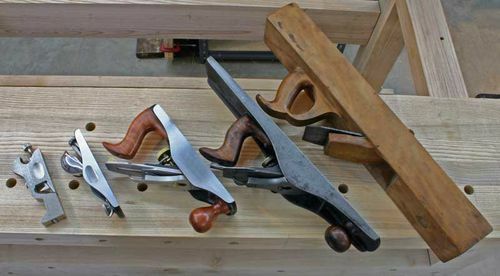 WARNING —Be careful about building up your number of hand planes… It can be very addictive! I have a couple freshly refurbished and available. PM me if interested or for more pics. 2 #4s and 2 #5s available. For jointing you can get a #6, Don has a couple for sale now. You can get something on eBay worth messing with for 25-35$ total. You take the chance of being burned for the cheap ones but for the most part they should be ok. I had a #5 I bought that had a cracked cheek under the crust. It’s probably the outlier but you have to be vigilant and not jump on the cheapest thing. Triple check pics. 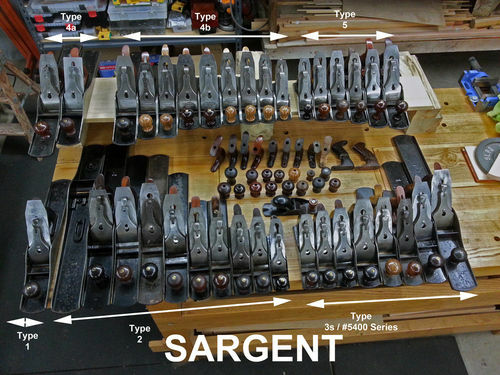 Check out Paul Sellers site on setting up/sharpening/restoring/using bench planes.